The final forms of Clinton-era Japanese sports cars are getting more collectible every year. The last Toyota Supras and Mazda RX-7s command crazy prices already and Mitsubishi 3000GTs can’t be far behind. As for Nissan 300ZXs, well, one just sold for so much money I am actually questioning my own sanity. If you haven’t seen the auction listing yet, I want to give you the opportunity to guess what you think a seriously museum-quality bone-stock black 1996 Nissan 300ZX Twin Turbo T-Top with a five-speed manual, tan leather interior and just 528 miles on its odometer would fetch on eBay from California car dealer Private Collection Motors right now. This particular car came with an extra dose of pedigree: it was the very last 300ZX to be sold Stateside, number 300 of 300 “Anniversary Editions” that Nissan sent the car off with here. The car was sold for a couple more years in other markets, but July of 1996 was the end of the Z as we knew it in America. Twenty years ago the sticker price on a turbo Z would have been about $45,000. Adjusted for inflation, that’s a whopping $71,000-plus in today’s money. Yeah, the 300ZX was no overclocked sport compact. This was a legitimate sports car, rated at 300 horsepower and 283 lb-ft of torque. As MotorTrend once pointed out, that’s about as much energy as a Ferrari 348 was generating at the time. The 300ZX was also considered pretty luxurious, with huge leather seats that looked straight off the set of Star Trek: The Next Generation, premium audio options, LCD climate control (I remember being impressed by that ten years ago, when a friend bought a used Z) and of course optional removable glass roof pieces. As cool as the 300ZX’s interior looked, and still looks, I have to say the body design of this car never really did anything for me. It’s just a little too “orca whale” to get me excited about going fast. But obviously quite a few people on eBay would disagree with me, because after over 50 bids the last U.S. 300ZX was rung up at $90,100. This auction caught my eye a few days ago when the price was sitting at about $60,000 and reserve had not been met. I shook my head. “Tell him he’s dreaming,” I sneered to the toy cars and stuffed animals I share an office with. 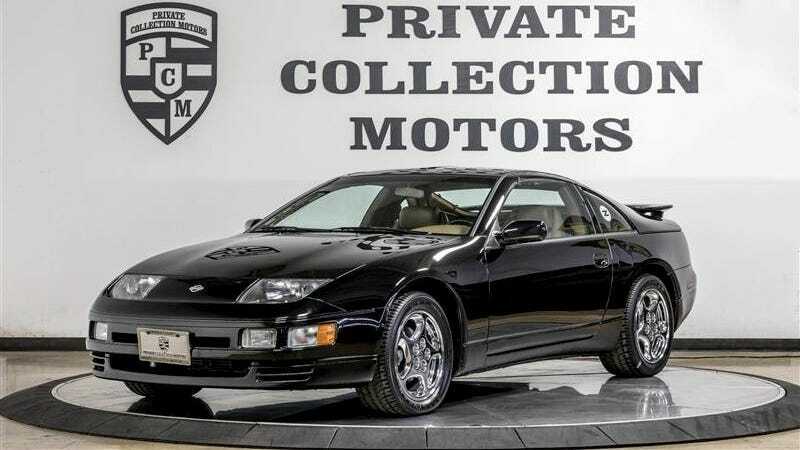 But the reserve’s cleared, eBay’s calling it “Sold,” and the value of what is probably the best 300ZX left in the United States has been determined at an astronomical $90,100. So, what does this mean? Other than at least a few people really, really wanted this car? Like I said at the top of this post, we’re already seeing Supras especially run into six-figure territory. If you want a car from this genre, I think you’ve still got time to find a decent deal. But the clock’s ticking.